LANSING— Beware the Northern snakehead. Beware the inland silverside. And beware a host of other invasive species prompting a recent report recommending spending billions to separate the Mississippi River from the Great Lakes. Of these species, 10 could potentially cause huge environmental damage, the agency said. The Cuban bulrush and marsh dewflower are two aquatic plants that could crowd out other plants and degrade fish habitats. The Cuban bulrush is native to South America and the marsh dewflower comes from Asia. Both have taken root across the southeastern U.S. and could spread to the Great Lakes. The inland silverside, a 6-inch fish, has made its way up the Mississippi to northern Illinois and could harm the Great Lakes ecosystem by competing with native species for plankton. The silverside already has significantly damaged fish in California and caused some to go extinct, according to the U.S. Geological Survey. 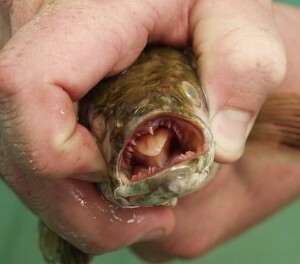 The northern snakehead, a predatory, pike-like fish that can grow up to 3 feet long and is known for its ability to breathe on land for up to four days and migrate between bodies of water up to one-quarter mile apart. It has established populations in Maryland, Virginia, Arkansas, Pennsylvania and New York. With a voracious appetite and no natural predators, the snakehead could destroy large populations of native fish and out-compete them for food. This is July 2013 and it may already be too late for keeping out the Northern Snakehead. Just did my short 1/4 mile Lake Michigan beach walk on the Leelanau peninsula and came upon a half dozen dead Snakehead, all about 6″ long. I will put our native predators against snakeheads any time, or any other. Stick your hand in a pikes mouth, you’ll only do it once!